Great quality! Took a few people to get it up but def worth it. Protect your vehicle from the elements for a fraction of what it costs to build an additional garage spot with the temporary carport from Outsunny. This multi-use structure is a feature-packed staple for anyone because it can be used for both residential or commercial purposes. Need a temporary carport to park your vehicle or perform maintenance during rainy weather conditions? Need a covered space for food service durn your next catered event? 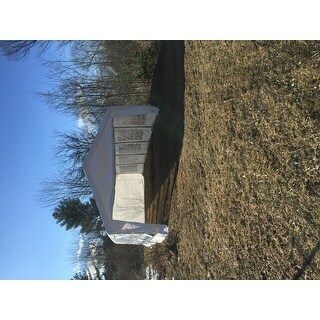 This tent with sidewalls is ideal for these applications and many more including picnics, weddings, and backyard parties. 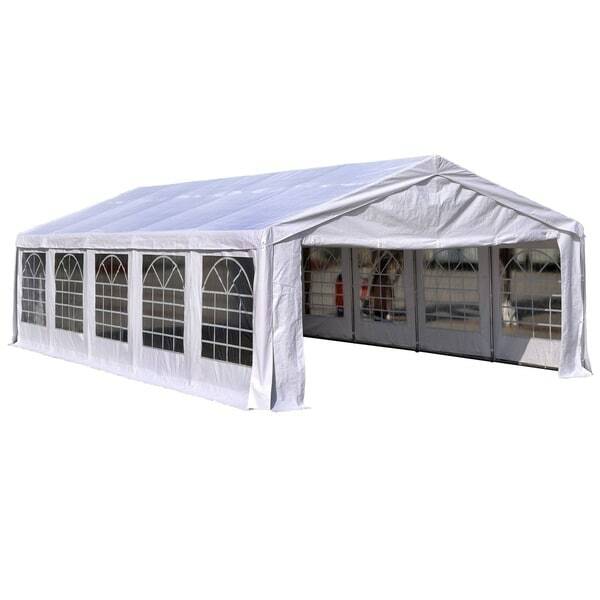 With extra-durable 180g, water-resistant polyethylene tarpaulin cloth and a solid powder coated steel frame you can use this structure again and again; year after year! Dimensions 384.0 In. X 192.0 In. X 110.4 In. This buy was the best! The frame is strong and sturdy. The canopy sidewalls are heavy duty and the decorative windows are elegant. I used this for a 200guest baby shower. It took 30minute for 4 people to put together. I recommend this product! It beat out renting one for my event. This was a great investment because I will use this for future events to come! Nice and heavy hopefully water proof have not got to see if this is or not. Have not got to set it up yet. Planning on using this for years to come, from what I have read it should have the space needed for large amounts of people and tables with seating for many. Going to set a band up under it in a few weeks. This is a real deal, some of the others stores wanted much more for this item. I have ordered from Overstock before and no complaints here. I have more things coming from here for this party, so far so good. You get what you pay for and this is a good deal, for good quality merchandise. We set this tent up, but haven't used it yet. We purchased ahead for a party in May, but wanted time in case anything was missing/damaged. It was well packaged and all parts were labelled individually. Based on prior reviews, I thought I'd need to do that myself so this was a nice surprise. We had one pole with a small dent, but pliers popped it back into shape perfectly. While this seems sturdy and "heavy duty," I would not say it could be used commercially. The cover is not quite of that quality, but it serves our purpose perfectly. I would recommend this to others. DO NOT BUY THIS PRODCT! Bought this product because it was advertised as a “weather proof/resistant” car port that I was going to use as a temporary race shop for my race cars. 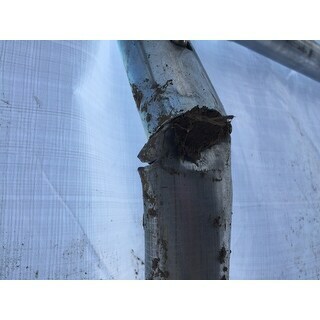 Bought it and received it about a month ago, installed about 2 weeks ago, 1 week after set up we got about 2-3” of wet snow and it completely bent the *** out of the “steel” posts. Went up to do some work yesterday and found out it completely collapsed due to wind in the area the other day. I am very unsatisfied with this purchase and will be getting in touch with both Overstock.com and OutSunny to get this resolved. Not happy. Great tent! Perfect for our summer get-togethers. This tent is fabulous!!! We used for a graduation party in our backyard. The price on this one was cheaper than anywhere else. People raved about it the whole evening. Can't wait to use again! And honestly it wasn't terribly difficult to put together or take down. Love it!! Stand outside and imagine a tent 16 x 32. You think you can! In reality there is absolutely no way. Well built, superior design, easy to assemble and looks great. I'm extremely pleased. Can't be beat...! Exactly what I expected. For the same price of renting one, we bought this for my daughter’s grad party and it worked great. The width was exactly the width of the garage we set it up next too. We put 5 6 foot tables on either side with a main walk way. Plenty of room! Had lots of compliments and people wanting to rent it from me. We had a heavy downpour right after getting it set up and no leaks. It was not windy so that’s the great mystery- how it will hold up in wind? I love it, heavy duty strong. It was easy to assemble, 3 people could put this together. It fits 50 people easy. 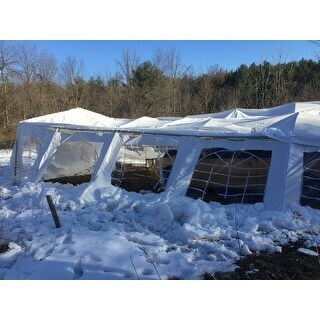 The downside is that I received 2 bent poles but it didn't affect the canopy from staying together and one of the plastic hooks on the tarp itself was missing. Other than that the canopy is great and affordable. Love how spacious the canopy is. It fit ten tables, 2 of which where round and still there’s plenty space for the backdrops and movement of people. I didn’t use the panels this time. 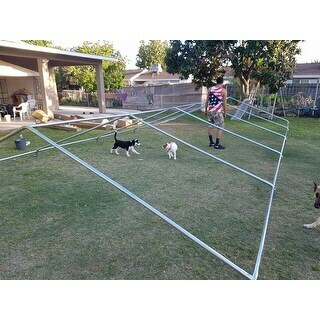 It was pretty easy to assemble and it took three people to put the tarp over. The strong pipes and size of tent. Esta perfecta , es de muy buena calidad la recomiendo mucho es algo pesada pero solo ocupa de dos personas para armarla es facil y muy buena . "How many people can the tent hold?" "Can this tent be used in the rain?" This tent is made from water resistant fabric. It can be used in inclement weather but should not be used in severe weather (it's not going to stand up to a hurricane, but it will be fine in rain showers). "Do the individual windows open separately or the entire side has to be opened? How is it anchored into the ground.? Putting this on cement"
The windows cannot be opened individually, they are part of the siding. The entire siding must be rolled up. It weighs over 300 lbs and has a steel frame so it does not need to be anchored to the ground. "Do the window walls come with the tent? Or just the front and back doors?" This item has 4 walls. Side walls have windows, door and back do not. All walls can be rolled up and secured with ties to make an open canopy. "Does this tent come with the windows? Or do you have to purchase separate??" 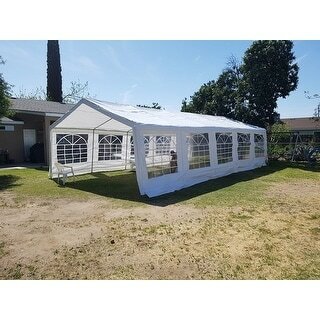 Tent comes with frame and four walls. Everything in the pictures. "I received my tent but no instructions or packing list so I know I got the entire tent. Should I have gotten something?" Hello, thank you for your question! You do need instructions for this, please reach out to customer service so one can be sent to you, thank you! "Who much those it weight ?" The shipping weight is approximately 50 lbs.